The ORIGINAL Draught House bar and grill in Omaha. 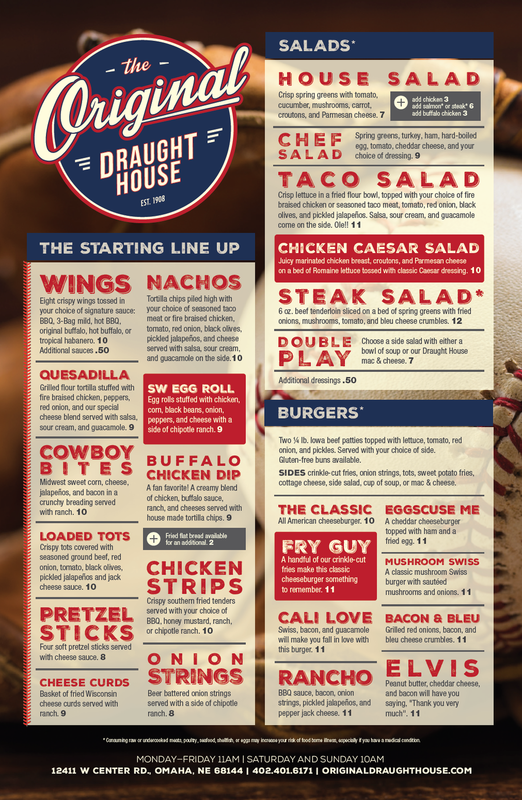 Below is the menu for The Original Draught House Omaha. Click on the image to move between the two pages. If you'd like to download and print the menu for your home or office, click here. Omaha's Original Draught House also proudly features BRUNCH on Saturday and Sunday starting at 10am. Watch a game on one of our many flatscreen HD TVs, drink a delicious Bloody Mary and enjoy Omaha's best brunch. To download a PDF of the brunch menu, click here.